Most of the pictures from my Paris flickr set are pictures from the Louvre. One of my favorite finds there was this marble statue. 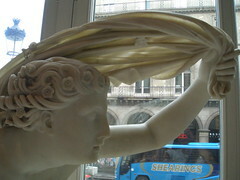 The marble was delicately carved to allow the cape to be translucent. I also love the little flower details that are in the hair and on the cape.It’s true that it would take days to see everything in the Louvre. But I found that one afternoon was enough to see the most famous sites, and then view the areas that most interested you. For instance, I focused on the antiquities and then the East Asian stuff. Although, since Korea was one of the few places in the world that France didn’t loot from, the Korean exhibit was quite small and unspectacular, and the same could be said of the Japanese exhibit. But do let yourself wander and be pleasantly surprised. I never would have thought I’d enjoy medieval iconic art but I was absolutely enthralled. And I wasn’t prepared for the sheer grandeur and size of the Raphael paintings. The Mona Lisa exhibit was more interesting for the throng of gawkers than for the painting itself. It’s truly more about what the symbol of the painting is than the actual work. I wonder how often people see art for what they are taught to think about it than what they see before their eyes. John Berger’s Ways of Seeing is one of the best accessible books on the subject. He addresses how art is more than just what we see; it’s also the socio-political frame in which that art is presented, and from which that art is funded and created. I felt that looking at the Mona Lisa from more than 10 feet away, through a thick bulletproof glass while jostling with a crowd of people was silly. One can get a better look at the painting from a poster in the museum gift shop. What is it that makes people want to see the ‘real thing’? For all we know, the Mona Lisa on display could only be a reproduction while the real one is somewhere safely deep in the Louvre’s vaults. It certainly would be wise to do this. And nobody would ever know since we can’t examine the painting closely. In fact, why go to museums at all when we can just look it up in an art book. Or even google it. It’s really a good question. However, there are some paintings that really need to be seen in person. Van Gogh’s thick strokes are almost like sculptures. And some of the Dutch masters have painted huge canvasses that are cool to gaze at face to face. My sentiments on seeing the Mona Lisa were the same as yours, the gawkers being more memorable than the painting. My favorite work of art in the Louvre, at the time I saw it, was Michelangelo’s Dying Slave. Today it might be something altogether different. Some art is definitely better seen in books. The Sistine Chapel, for me, was very disappointing. However, the impressionistic works in the Musee du Jeu de Paume (now at the Musee d’Orsay) were absolutely breathtaking to see in person. Same with the works in the Auguste Rodin museum. i agree with you about the impressionists. no photo can capture the colors. but i’m surprised to hear that the sistine chapel was disappointing. i still want to check it out for myself though. The Sistine Chapel was very dark. The ceiling is quite high so you don’t get to see the details the same as you would in a photograph. The altar wall in the chapel was painted by Michelangelo later in his life. The theme is The Last Judgement. It too was poorly lit at the time. Hopefully they’ve improved the lighting since I saw it. wow, that sounds completely demoralizing. i guess i won’t be rushing to that masterpiece. after a certain point, preservation seems to take precedence over showing a work in all its glory.